Here at Streatham Park Surgery we are constantly striving to improve our services and need your feedback to improve the care we provide. I heartily recommend Streatham Park Surgery. The standard of care is first class and very professional and thorough. My current condition has been a little baffling to diagnose, but my treatment and level of care and compassion applied to it has not suffered at all throughout a number of recent visits. I have been anxious throughout but the doctors recognised this and still took an interest in my case. I am grateful to all of them for their care and on-going reassurances. I especially like the fact that the surgery contacted me directly for a few kind words when necessary. This shows compassion and tells you that you are being treated as an individual not just a target to be met. Many thanks to all the staff at the surgery!!! Friendly service and simple to use the surgery. Doctor understood what I needed and helped me. Dr Scariya was considerate and thorough. The male receptionist was also attentive, polite and informative. It's very easy to make and get an appointment when u need it.You r seen mostly on time.Every one are very helpful and friendly.You always feel like you have had the best treatment. All the staff are efficient and friendly. I was 15 mins late for my blood test but I was allowed to wait and had it done. Much appreciated. Very nice gentleman at recap very help at all time the nurse was also nice. Great service from a very knowledgeable doctor and reception staff. We are introducing Patient Access to our patients. View parts of your medical records. If you would like to register for Patient Access, please ask a member of the reception team for a registration form. Please note that you will be asked to bring in photographic ID and a bill at your current address within the last 3 months to verify your identification. Streatham Park Surgery is now linked to the app available for apple or android phones. 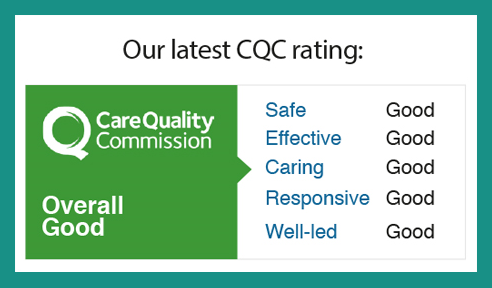 Please click on the following link https://www.cqc.org.uk/location/1-549305177 to view our current rating and download our latest inspection report.